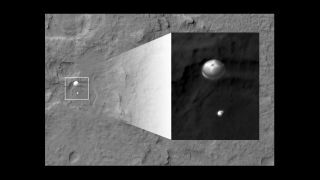 NASA's Curiosity rover and its parachute were spotted by NASA's Mars Reconnaissance Orbiter as Curiosity descended to the surface on Aug. 5 PDT (Aug. 6 EDT). The High-Resolution Imaging Science Experiment (HiRISE) camera captured this image of Curiosity while the orbiter was listening to transmissions from the rover. This story was updated at 2:32 p.m. EDT. A spectacular photo by a spacecraft orbiting Mars has captured NASA's new rover Curiosity as it plunged toward the Martian surface under a giant parachute. The amazing image was captured by NASA's Mars Reconnaissance Orbiter, a powerful spacecraft that has circled the Red Planet since 2006. The orbiter snapped photos of the Mars rover Curiosity as the robot dangled from a supersonic parachute six minutes into its "seven minutes of terror" landing late Sunday (Aug. 5 PDT). NASA's Mars rover Curiosity is spotted descending to the Martian surface under its parachute in this amazing photo by NASA's Mars Reconnaissance Orbiter on Aug. 5 PDT, 2012. The MRO spacecraft used its high-resolution HiRISE camera to capture Curiosity's descent to the floor of its Gale crater landing site. The image was taken just one minute before the Curiosity rover landed on Mars. At the time, the rover and its rocket-powered sky crane backpack were still tucked inside their backshell and were slowing down with the help of the parachute. Milkovich unveiled the photo, as well as an inset, today less than a day after the Curiosity's successful landing. The orbiter was 211 miles (340 kilometers) away from the Curiosity rover when it snapped the photo, and captured amazing details like the lines and hole on the rover's parachute. "If HiRISE took the image one second before or one second after, we probably would be looking at an empty Martian landscape," Milkovich said in a statement. It took months to prepare the MRO spacecraft to photograph the Curiosity rover's landing, Milkovich added. Mission programmers began working on the project in March and only uploaded the computer commands to MRO a few days ago. MRO was one of two NASA orbiters to watch Curiosity's landing on Sunday. The European Space Agency's Mars Express also helped track the spacecraft while NASA listened to the rover remotely using a Deep Space Network antenna in Canberra, Australia. NASA's MRO spacecraft is the youngest orbiter circling Mars, despite launching in 2005. It has been circling Mars since arriving in orbit in 2006. "Guess you could consider us the closest thing to paparazzi on Mars," Milkovich said. "We definitely caught NASA's newest celebrity in the act."